Global Invacom Optical LNB The Satellite Reception Revolution At first you might be thinking that it’s one of Luke Sky walker’s newest weapons, but in reality it’s one of the most ingenious ideas that we have seen in several years; an idea that does away with the biggest problem facing the direct reception of satellite TV, namely the signal attenuation or signal loss in the coax cable between the LNB and receiver as well as the problems associated with signal distribution to multiple users. But what’s so special about an Optical LNB Satellite Dish Fibre Optic Cable ? First we want to remind you how a standard LNB works: the LNB receiver the focused satellite signals from the antenna, converts them to a different frequency range and routes these signals to a satellite receiver tuner via a coax cable. Since this frequency range is limited to 950 to 2150 MHz, two tricks had to be used in order to receive the entire frequency spectrum of a satellite. The first would be the polarization of the signal and this would be either a vertically or horizontally polarized signal. Circularly polarized signals (left and right) are also used but on a much smaller scale. It really isn’t necessary to go into any additional detail on circular polarization; for the purposes of this article they behave in the same way. The 13V or 18V control voltage carried by the coax cable to the LNB dictates whether vertically (13V) or horizon-tally (18V) polarized signals are received by the LNB. The second is the 22 kHz control signal that is used to switch between the low and high bands. The low band covers the satellite frequency range from 10.7 to 11.75 GHz while the high band covers from 11.8 to 12.75 GHz. If the LNB “sees” the 22 kHz control signal from the receiver, it sends the high band signals via the coax cable to the tuner. If the 22 kHz signal is not there, the LNB switches to low band. In the end there are four possible scenarios (vertical or horizontal in low band OR vertical or horizontal in high band) but only one of them can be used at any one time. If it’s a single satellite Dish antenna systems for just one user, then everything is fine and dandy. But the moment there are more than one user receiving satellite TV from the same antenna, that’s when the first problems surface.If,for example, user A needs the LNB to operate in the vertical low band, everyone else on the same system would be stuck receiving the same vertical low band signals; the number of available channels would be severely limited. In reality, such a setup would make absolutely no sense; none of those users would have any fun watching TV. Up until now, this type of problem was solved using LNB’s with up to eight individual outputs; each attached receiver would be able to operate independently of all the others and get whatever band/polarization it needed. If more than eight end-users were involved, multiswitches would then come into play. In this case a Quattro LNB with four unique outputs that cover the four band/polarization combination would be used. These signals would then be distributed to as many users as is needed. But all is not as simple as it seems. All of the coax cable that is used along with the various multiswitches used for signal distribution bring with it signal attenuation that in truth cannot be ignored. The signal attenuation associated with 8 to 10 user outputs can still for the most part be considered negligible. But with 20, 30 or even 40 outputs, the signal attenuation problem could be quite significant. This is where the optical LNB comes in. A stacker built into the LNB converts the four band/polarization combination into different frequency ranges between 0.95 and 5.45 GHz. After wards, the RF signal is converted to a digi-tal signal and transmitted by laser via a fibre optic cable.Hence the name optical LNB. At the other end of the fibre optic cable, the light beam enters a converter box called a GTU (Gateway Termination Unit) where it is transformed back into a signal that is recognizable by any standard satellite receiver. These GTU’s from Global Invacom are available in Twin, Quattro or Quad versions. While the Twin and Quad versions are connected directly to a receiver, each output of the Quattro version delivers one of the four band/polarization combos and is typically integrated with existing multiswitches. This means that one fibre optic cable can carry the entire frequency range of a satellite. A 3mm thick fibre optic cable running from the optical LNB is all that’s needed. Since the light beam contains the entire frequency spectrum of a satellite, it is possible to connect as many receivers as is needed with each operating independently from all the others all from this one fibre optic cable. Even, for example, if an entire large apartment building needs to be supplied with satellite signals, the optical LNB brings with it enormous possibilities. From this point it would be enough to lay one fibre optic cable from the LNB to a central distribution point. It would then be split into multiple fibre optic cables with one routed to every floor of the apartment building. On every floor the cable would be further split and routed to each individual apartment. The end user would then be able to connect not just one receiver, but, for example, he could easily connect a Twin Tuner PVR in the living room, another receiver in the kids room and yet another in the bedroom. If standard coax cable were used, each apartment would need four coax cables from the multiswitch in order to accomplish the same thing. It’s not hard to recognize the enormous potential that optical LNBs have. It greatly simplifies and reduces the installation costs of larger satellite reception systems. It also brings with it new possibilities even for individual users. We all know this problem: while planning a satellite system a few years ago, who would have expected the big boom in Twin Tuner PVRs? Many of these systems only included one signal cable and in many cases there’s no more room to add any extra cables in the ductwork. Up until now, you had to make do with fairly decently functioning stackers or muddle through using the loop-through feature on a receiver. But in the future it will be enough to swap the existing cable with a fibre optic cable so that four or even more receivers can be used at the same time and totally independently from each other. The optical LNB is some-what larger than a standard LNB and elongated. It’s not surprising; the entire electronics needed to convert to an optical signal has to fit inside. Underneath the LNB are two connections, the optical output for the fibre optic cable and also an F connector. 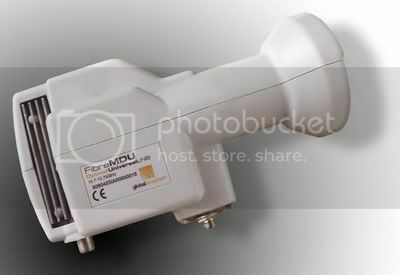 The F connector is not used for any signal transmissions; instead it is used as the power connector for the LNB since no power can be carried by the fibre optic cable. Global Invacom chose an F connector for good reason. Yes, a typical power supply connector could have been used but why go that route if a coax cable is already in place? Many existing systems will convert to using an optical LNB and that’s why the F connector makes sense. The existing coax cable is simply plugged into the F connector on the LNB; the other end of the coax cable is connected to the included power supply which in turn is plugged into a wall outlet. The coax cable becomes the power cable for the LNB. Unlike coax cable which is relatively insensitive to dirt accumulation, the cleanliness of fibre optic cable is much more critical. The problem is not with the cable itself it is encased in a metal jacket that helps prevent the cable from getting bent, twisted or otherwise deformed but with the connectors: they require extreme cleanliness. 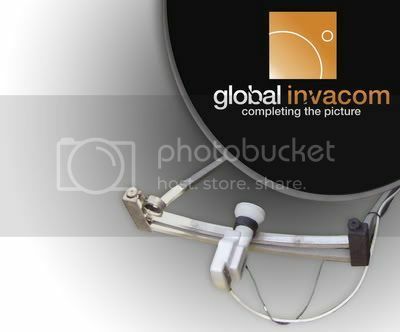 For this reason, Global Invacom offers their own special cleaning cloth which is used to clean the ends of the fibre optic cable before being connected to the LNB or converter box. And while we are on the subject of cables, Global Invacom will also be offering matching prefabricated cables once the sale of the optical LNBs has begun. Sizes will include 1m, 3m, 5m, 10m plus various additional lengths up to 200m. With the help of an adapter plug, these prefabricated cables can be connected together so that any desired length can be achieved. 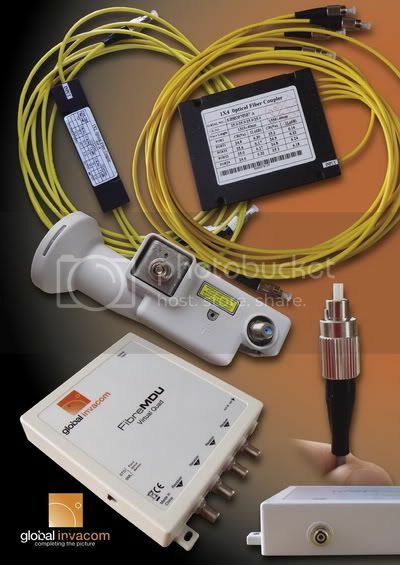 Global Invacom will also make the fibre optic cable available by the meter without any connectors. In this case special equipment will be needed to attach the optical connectors. 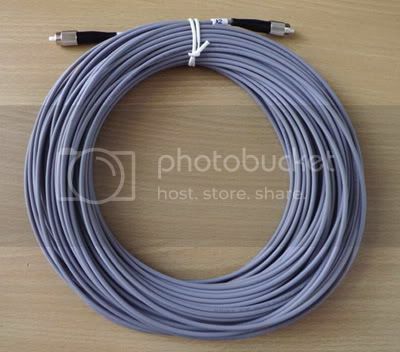 The fibre optic cable,like other standard cables, is further protected from dirt and moisture with a rubber outer casing that surrounds the metal protective jacket. This outer casing is avail-able in a variety of colors or if necessary can be painted to match the environment. Additionally, it is an LSZG (Low Smoke Zero Halogen) material that won’t give off any poisonous smoke if it should catch fire. Another important advantage of fibre optic technology is that it is completely immune to any electromagnetic interference. Fibre optic cables can therefore be placed in close proximity to strong electrical fields without any problems at all. Nothing like that exists in the TELE-satellite building but in order to be prepared for future applications, we ran a 50m long fibre optic cable through existing duct-work past electrical and data cables from the roof all the way to our test center. The small diameter of the fibre optic cable came in handy here: roughly three fibre optic cables fit in the same space that one coax cable required. Since the cable is quite robust thanks to its metal jacket, we were able to pull it through ductwork without any complications and even bend it around corners that were less than 90°. Once we laid the fibre optic cable all the way to the office roof, we swapped the old standard 0.3 dB noise figure LNB that was on our offset antenna with the optical LNB. Next we ran the coax cable to the closest wall outlet to power the LNB and then we were ready to go. After quickly cleaning the end of the fibre optic cable, we plugged it into the converter box along with a ‘signal analyzer” via a short coax cable. We were impressed with the initial results regardless of what frequency was received and the satellite we were pointed to, the optical LNB was a step ahead in terms of signal quality. These results did not change when the fibre optic cable was split four times and connected to four receivers that were operated at the same time. The higher MER values on HOTBIRD at 13° east were clearly recognize able as were the strong signal peaks in the spectrum. The results that the optical LNB delivered were so impressive that our standard 0.3 dB noise figure LNB together with 50m of coax cable simply could not keep up. According to the manufacturer, the splitting of the fibre optic cable is currently limited to 32 outputs. This limitation exists because of the laser’s signal strength. For special applications, Global Invacom can generate a stronger laser signal so that the number of outputs can be increased as needed. The extremely small signal attenuation through the fibre optic cable of a mere 0.3 db over 1000 meters (!) definitely comes into play here. If the Global Invacom idea catches on, then there will no longer be a need to use coax cable for direct satellite reception and we don’t see any reason why this vision shouldn’t become reality. Fibre optic cable is not any more expensive than good quality coax cable. The optical LNB is in practice identical to standard LNB models; even supplying the power via the coax cable should become the norm. Not only that, fibre optic cables can be used anywhere;it doesn’t matter if it’s placed next to high voltage lines or even a powerful electric motor. Global Invacom even thought about those customers that receive DVB-T signals via a coax cable: thanks to a special adaptor, fibre optic cable can be used here too. The biggest plus with the optical LNB is that all four band/polarization combination can be transmitted through the one cable at the same time.That brings with it the advantage that the signal can be split as often as needed and that each output can operate completely independently from all the others. The extremely long distances that fibre optic cables can be run without any appreciable signal attenuation is another huge bonus. Fibre optic cables are small in size and will easily fit in any ductwork. Because of its extremely low signal loss, it is significantly better over very long distances than coax cable in terms of signal quality. With weak signals this could easily be the difference between receiving a signal and not receiving it. Distances covering several kilometers can be run without any significant signal loss;Global Invacom has already performed some field tests in that regard. Additionally, the optical system has lower material costs compared to systems using expensive multiswitches. since the setup of a system for multiple users can now be calculated differently than in the past. Only one LNB at about 200 Euros is needed. The material needed to connect two or four receivers is also around 200 Euros. The necessary fibre optic cable runs a little under 2 Euros per meter (shorter lengths with connectors cost more per meter versus longer lengths that cost less). Then there are the optical splitters that run about 30 Euros for a two-way splitter, roughly 70 Euros for a four-way splitter up to 160 Euros for an eight-way splitter. The installer would also have one-time costs associated with optical test equipment. For Global Invacom the market introduction of the optical LNBs is only the firstof many large steps. At the moment the signal makes its way from the LNB to the converter box via a fibre optic cable but the remaining short distance to the tuner is still covered by a coax cable. For this reason Global Invacom has already been in contact with tuner manufacturers with the idea of incorporating fibre optic technology directly in the receiver. For the end user this means that no converter box would be needed and that the signal could be carried digitally all the way to the chipset in the receiver. As we would expect, Global Invacom is thinking even further ahead and already has the technology to carry not only satellite signals but also telephone, Internet and local network satellite tv services. This would mean that the TV, receiver, PC, telephone, etc, would not only be served by a single cable, but that all of these devices could communicate with each other through the fibre-optic cable. Controlling all of these devices now takes on a whole new meaning. The optical LNB should prove to be a formid able competitor to the classic coax cable system setup. Who would be satisfied with a limited preset number of channels when they can receive the entire frequency spectrum of a satellite with 1000 channels free of charge? And thanks to Internet access and telephone via Global Invacom’s fibre optic technology, cable’s Triple Play promotion doesn’t count for much anymore. An Optical LNB Satellite Dish Fibre Optic Cable allows the transmission of these three communication service more cost effectively to as many households as is needed over long distances and with more choices for the end-user. We should also mention that Global Invacom’s fibre optic technology could revolutionize Internet access in the future since no other type of connection today is as fast as via a fibre optic cable and let’s not forget that the same fibre optic cable can carry all of your favorite satellite TV signals. We are witnessing the dawn of a new age in direct satellite reception and in just a few years we will only be able to marvel at coax cable in a museum and no longer on our satellite antennas and receivers thanks to innovative companies like Global Invacom!